Get ready to play the best guaranteed win bingo games ever! Grab JUMBO bingo prizes when you play thrilling daily, weekly, and monthly games at Loony Bingo! In the guaranteed jackpot game Self Made Millionaire, you can play bingo for a Mega Jackpot of up to £1,000,000 – with guaranteed winners every time! Play Bingo Multiplier and Pay Day Bingo for a chance to win bingo prizes that are crazy big! 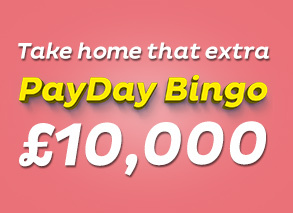 Both games have a mega bingo jackpot of £10,000 with guaranteed winners in every game! You strike it crazy rich!